Magic at your wedding reception or rehearsal dinner is a great way to add memorable entertainment and celebrate the special day. Brandon customizes a performance that is tactful and tasteful, that doesn’t monopolize or detract from the focus of the day, but rather highlights the special occasion. The performance includes a special piece of magic leaving the bride and groom with a tangible reminder of their commitment to each other! 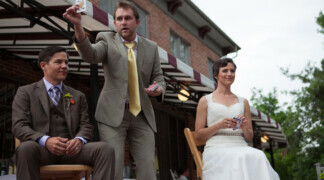 Brandon can also perform a few pieces of magic and then introduce the bride and groom. 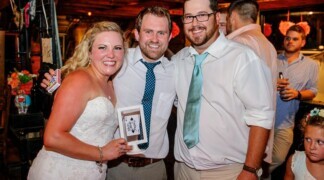 Regardless of how you choose to incorporate magic into your wedding, Brandon will work with you to make sure you and your guests enjoy the magic as well as the rest of day. During the Reception: Brandon can preform walk around magic while your wedding guests wait for the buffet to open or while you take the hundreds upon hundred of obligatory photos. This is a great way to keep your guests entertained during the reception and not all huddling around you and your significant other. For the rehearsal dinner: Let Brandon perform a show following your rehearsal dinner. This not only adds great entertainment to the evening but also breaks the ice for the wedding party to make their toasts. Brandon’s performances get the ball rolling for a fun, interactive evening, encouraging friends and family to celebrate your special day together. To introduce the new couple: Let Brandon introduce you by performing a short formal show. This works great to kick off the bouquet toss, first dance, and other reception events, by getting everyone’s attention and showing them some great magic. Brandon is available for YOUR next event! Whether it’s a small dinner party or a large corporate event, Brandon can provide great entertainment for you and your guests.